Manufacturer of a wide range of products which include exhaust bellows and exhaust expansion bellows. 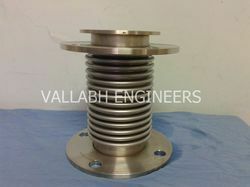 We manufacture & supply superior quality of Expansion Bellows. Owing to the features like robust structure, corrosion resistant, high performance and long functional life at high Temperature. This Bellows Use in Diesel Generator, DG Silent Generator Expanust, Automobile Exhaust Line.